Oooh baby! It’s been a while since I’ve made a pound cake! 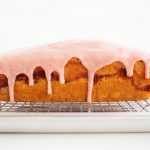 I love making/eating pound cake — but somehow I’ve forgotten about it for a while. UNTIL NOW! 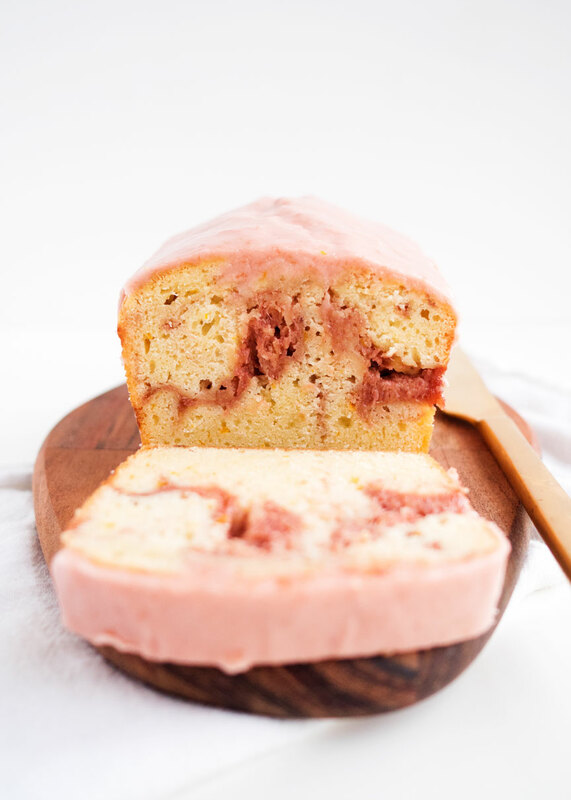 Welcome back with this beauty: orange rhubarb swirl pound cake. 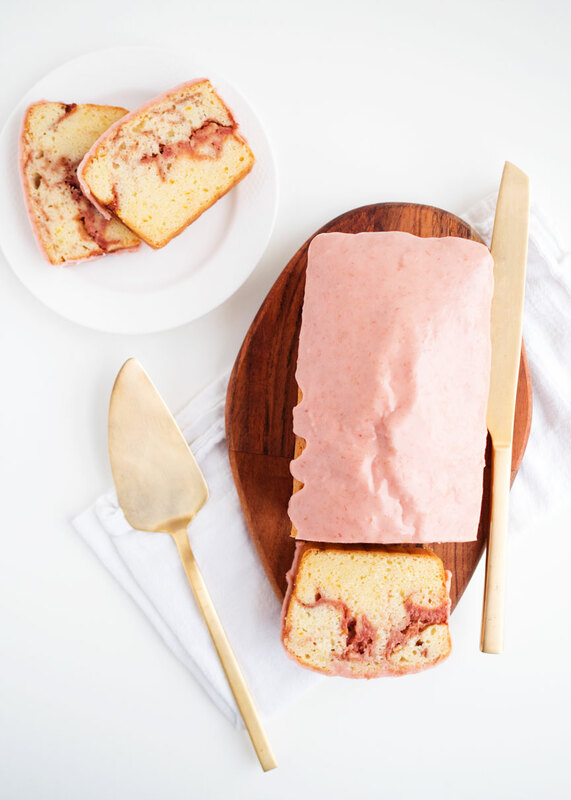 Exact same principle as my strawberry swirl pound cake: fruity puree swirled into rich buttery pound cake, baked into perfection and topped with a sweet fruity glaze. Dare I call this breakfast? It’s fruit, so yeah. Or lunch. Or dinner. Or ANYTIME deliciousness. 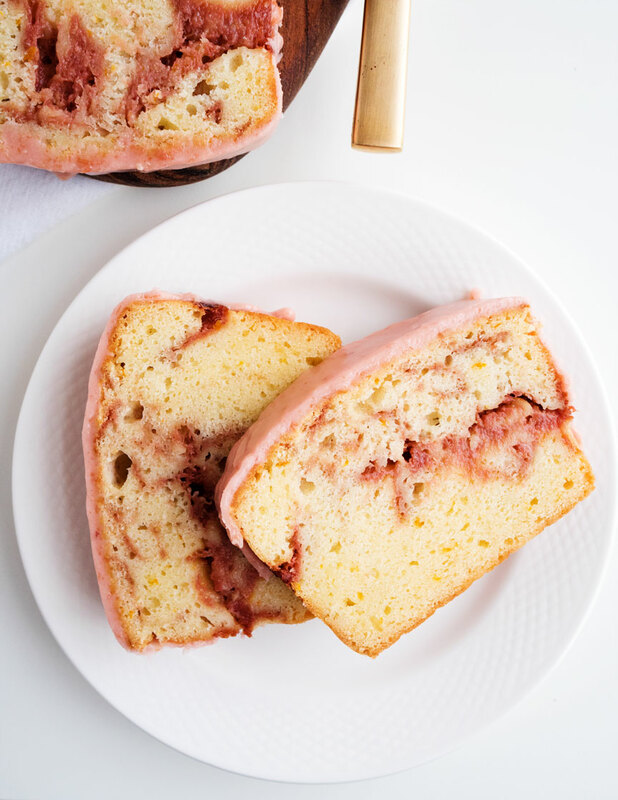 This sweet and tangy pound cake has swirls of rhubarb laced with orange, and is topped with a glaze made of rhubarb puree and powdered sugar. Preheat the oven to 325 F and prepare an 8″ loaf pan with butter and parchment paper. 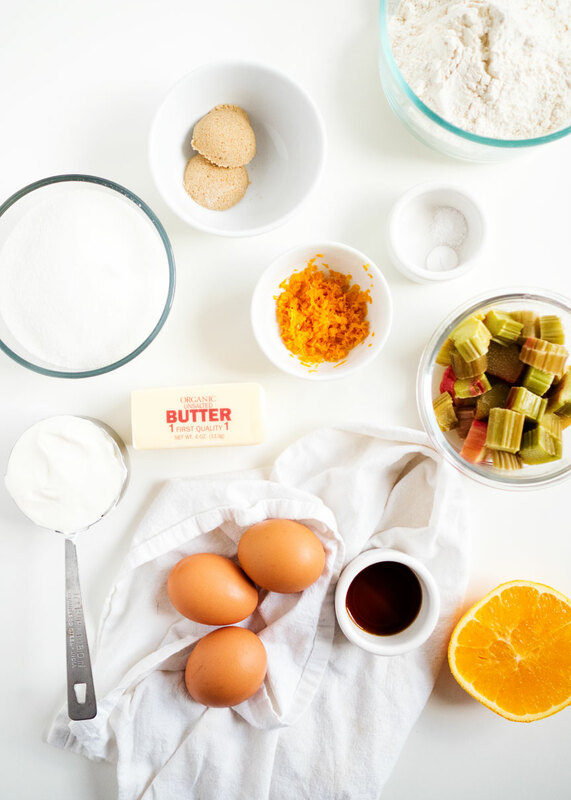 In a stand mixer with the paddle attachment, beat the butter, sugar, and 1.5 tsp orange zest together until light and fluffy. Add the vanilla, orange juice, and sour cream. Mix until smooth. In two batches, add the flour to the wet mixture, mixing until just incorporated. If you’re using fresh rhubarb, cook it in a saucepan with 2 Tbsp water until it is very soft, but not mush. Drain off excess water, and blend into as smooth a sauce as you can. Add the brown sugar. Set 1/4 cup of the pureed rhubarb aside for later. If you’re using frozen rhubarb, microwave until thawed (it will be soft), drain the water, and follow the same instructions as above. 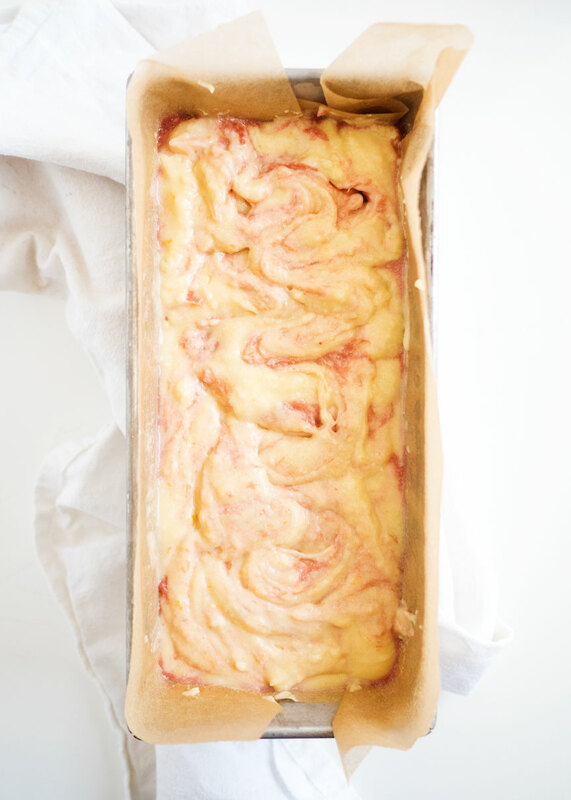 Fill the loaf pan halfway up with cake batter, then pour about 1/3 cup of the rhubarb puree on top. Pour the rest of the batter on top of the puree, and use a butter knife to swirl everything together. Bake for 65-70 minutes, or until a cake tester comes out clean. You may need to tent with foil to avoid too much browning. Let cool before mixing the remaining rhubarb puree with the powdered sugar and remaining orange zest. Pour over the loaf and allow to set before serving. A quick question – what do you mean by AP flour? Question, my frosting is super runny and I’ve already added well over a cup of powdered sugar. Do you have any recommendations? Hi Amber! Keep adding powdered sugar! Even the little bit more of liquid requires a ton more powdered sugar, so this will definitely vary person to person! Hi, do you know what I should do to alter this recipe for high altitude? I am at 4500 ft. Thanks! Pure perfection !Thank you so much ! 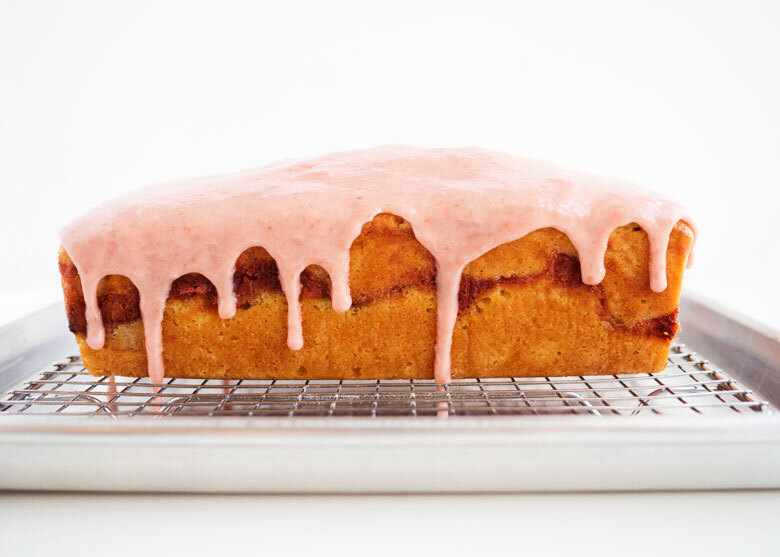 How did you make frosting pink? With rhubarb! If you have enough pink rhubarb (not green), it should be fine. Otherwise, you could throw in a raspberry or two for some color!